FIFA vice presidents Juan Angel Napout and Alfredo Hawit have been banned from soccer after being indicted on bribery and racketeering charges. The FIFA ethics committee says judge Joachim Eckert applied the provisional bans, which were requested by ethics prosecutor Cornel Borbely. 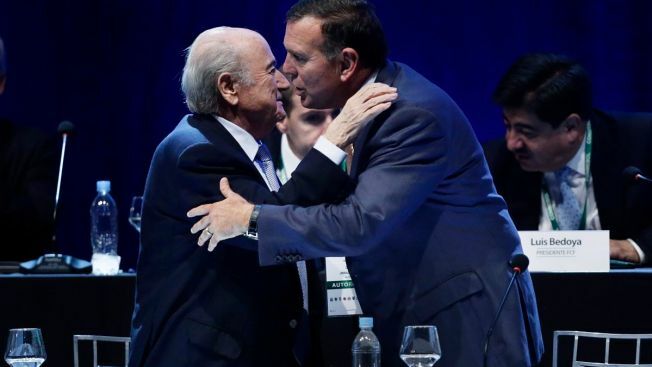 Napout, the president of South American confederation CONMEBOL, and Hawit, president of North and Central American and Caribbean body CONCACAF, were arrested in pre-dawn raids at a Zurich hotel on Thursday. They were indicted by the U.S. Department of Justice for allegedly taking millions of dollars in bribes from television and marketing rights. Napout, from Paraguay, and Hawit, from Honduras, are resisting extradition to the U.S. while being detained in Zurich-area jails. The FIFA ethics bans are routine for officials indicted in the sweeping American investigation. CONCACAF's executive committee also provisionally banned Hawit along with six others who were indicted. Among them was Rafael Callejas, Honduras' president from 1990-94 and a current member of FIFA's television and marketing committee, and Hector Trujillo, a judge on Guatemala's Constitutional Court who is general secretary of Guatemala's soccer federation. Trujillo was arrested on Friday aboard a cruise ship at Port Canaveral, Florida. —Reynaldo Vasquez, a former president of El Salvador's federation. Also Friday, a lawyer for former Brazilian soccer federation president Jose Maria Marin, who was indicted in May, said his client has deposited a total of $1 million bail with the clerk of the federal court in Brooklyn, New York. The court said Friday it had received the final $230,000. In a letter to U.S. District Judge Raymond J. Dearie, lawyer Charles A. Stillman said Marin hopes to obtain a $2 million surety bond, the final item of collateral, in the next week. Guatemalan prosecutors issued an arrest warrant for Jimenez.